I am entering my card for 4 challenges today. This is my entry for the above 4 challenges. Just a reminder that the Cowgirl Sunday Stamp'en Challenge theme for this week is a sketch using the colours turqouise, pink or red. This weeks challenge is sponsored by Prairie Fairy the winner will get 5 Prairie Fairy images, 2 Cowgirl images, the Winners Badge and be the Guest Designer for the month of August. There are also 3 x Top 3 badges up for grabs. A new challenge will be starting on Sunday around mid-day GMT the sponsor is Michelle Perket. Please hop on over and have a go I would love to see all your creations. In the mean time hop over to see the rest of the posse Ang, Annette, Beccy, Elke, Jovita, Lorraine, Peggy, Rach, Sarah W, Sheng. hahahahaa oh no... you are not boring us!!! when we dont like to read, we look at your wonderful card!! it is so nice!! like the soft colors! Love the card hun, really sweet! Thank you for you kind comments too, I really appreciate everyone who does comment on my creations. 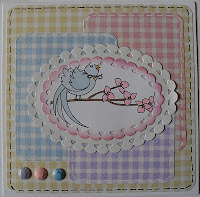 Beautiful card Poppet, love the patchwork! Thank you so much for the comment on the BnW blog!! Hugs to you! Beautiful! The soft colors are lovely and I adore the bird image. Thanks for playing with us at SSDS this week! Aww, so cute and sweet! Perfect colors for a baby card too! Such a beautiful card Poppet. The image is fab and I love the gingham papers and the lovely, soft pastel colour scheme. This is such a cute image and such pretty colours, lovely. I left a comment earlier today and again this evening and it wouldn't post so here goes you never know third time lucky. Have a good weekend. Papers and image are great. What a soft colored card! Love it!!! Thanks for the hugs girl!!!! Have a super duper weekend,and I'll try to do the same! Thanks for joining in our 'Check it Out' challenge at MTTC this week. 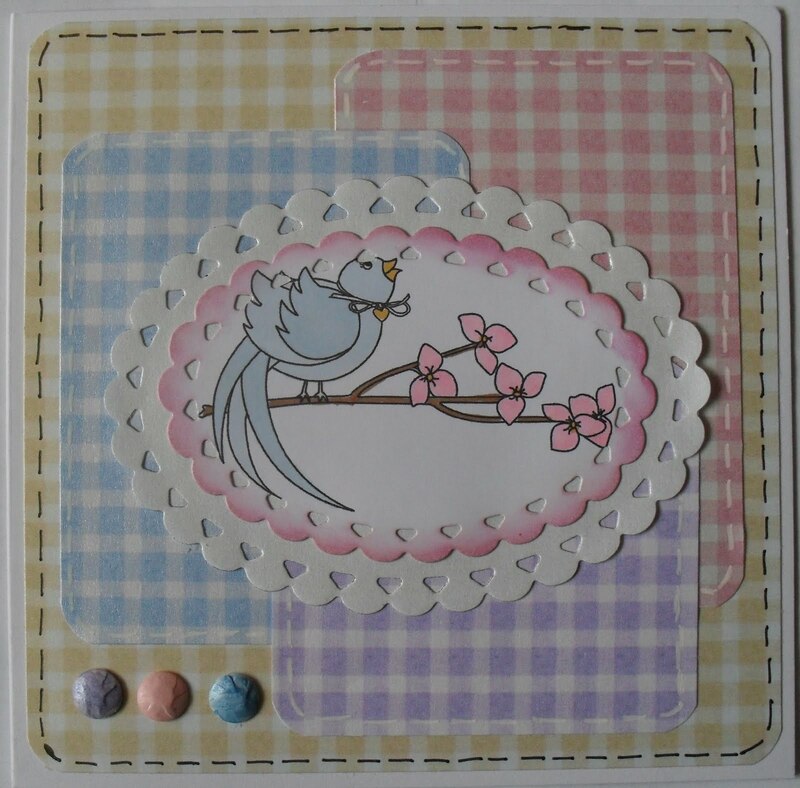 Hi Poppet hun this card is wonderful, I loce the colours they are lovely & soft & your colouring is FAB. Look at you entering 4 challenges, go there girl lol. Hope you have a fab weekend hun, take care. Such a sweet card! I love the combination of all the gingham patterns! Thanks for joining us at DU2DS. hi my wonderful crafter! please, i need a few more days to send you the card, don t be angry with me...... so glad to know you!!! Such a pretty card with those soft, soothing colors! Great faux stitching and a super cute image! Love it!! Wow wow wow! I am so loving the delicate colors on this! My goodness, that oval frame around your beautifully colored image is gorgeous too! I love it!!! Such a BEAUTIFUL card!